A fanless thin client designed to for computing highly confidential and propriety information in places where security is vital, such as government, healthcare, and enterprise environments. The DS437T supports Trusted Platform Module (TPM) to secure highly sensitive data and protect it from theft. 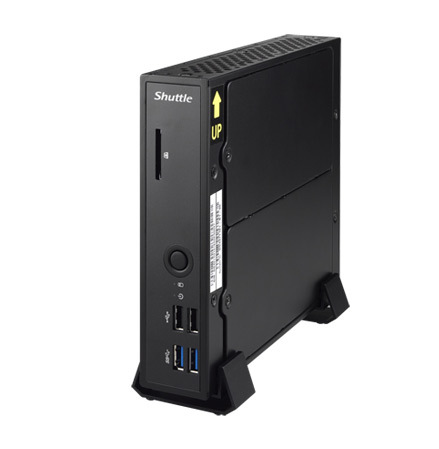 Shuttle’s DS437T is an ultra-slim PC with a body thickness of less than 40mm. 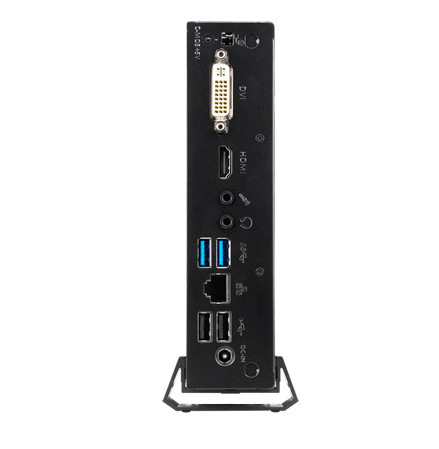 It’s made for easy configuration into thin client, digital signage, POS, education, healthcare and automation applications. 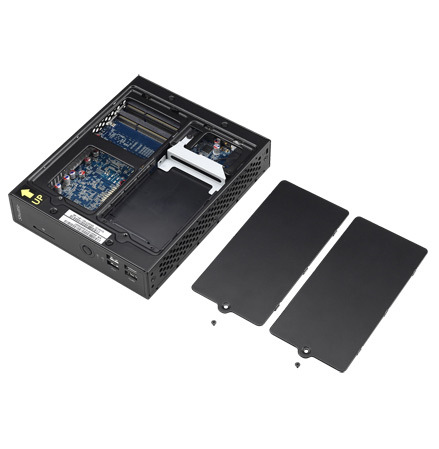 The fanless design ensures 24/7 reliable and silent operation. 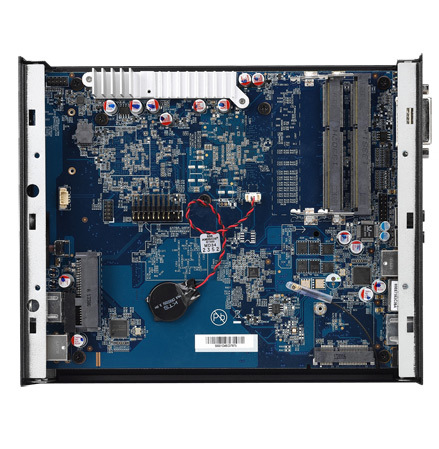 The DS437T is equipped with an Intel® Celeron 1037 U 1.8Ghz dual-core processor, built-in Intel® HD Graphics to play Full HD/1080P, and provides HDMI and DVI-I video outputs for dual-screen display. The DS437T has two USB2.0 and two USB3.0 ports at both front panel and rear panel to provide high-speed transmission. It also features Gigabit LAN and Wi-Fi capabilities. 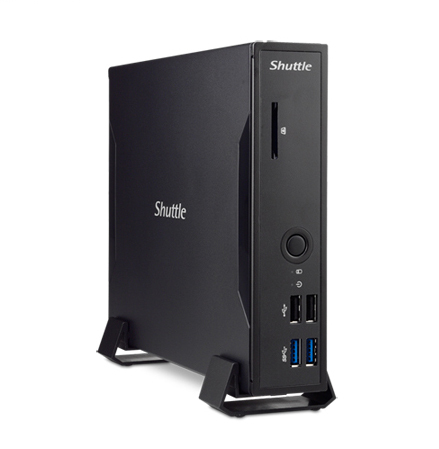 Shuttle’s DS437T is equipped with an Intel® Celeron 1037 U 1.8Ghz dual-core processor, memory support for up to DDR3-1333 16GB, and built-in Intel® HD Graphics to play Full HD/1080P. Trusted Platform Module can be installed internally. It provides a set of random keys to protect data security. TPM ensures that unauthorized users do not have permission to access data. The DS437T uses ideal cooling thermal module with cooled heat pipes to transmit heat to throughout the cooling module quickly and evenly. The device achieves high cooling efficiency without cooling fans. Combined with a precise vent design, waste heat inside the computer can be drawn out quickly. The DS437T features DVI-I and HDMI ports at the back panel; it has a built-in Intel® HD graphics processor to support dual-screen display. An adaptor can be used to convert HDMI into DVI interface and DVI-I port into D-Sub interface to diversify signal selection and provide dual monitor and standalone display options. The DS437T has four built-in USB 2.0 ports and four USB 3.0 ports. Users are able to connect various USB port peripherals. A USB 3.0 port which supports up to 5 Gbps provides 10 times greater data access speed than a USB 2.0 port. The compact DS437T has multiple screw holes specially designed on the side of the chassis. This design not only complies with international VESA Mount standards, but also allows users to choose the most appropriate back hanging configuration and placement under different environments. This space saving capability is well-suited for digital signage applications with limited space. The DS437T has built-in 10/100/1000 Mbps LAN interface and supports Wake On LAN function. With a built-in IEEE802.11b/g/n wireless network card, transmission rates reach up to 300 Mbps, significantly enhancing the system data transfer efficiency and saving operation time. The DS437T is officially approved for 24/7 permanent operation. The low power consumption design provides stable operation in order to reliably meet the long-term demands of various applications. 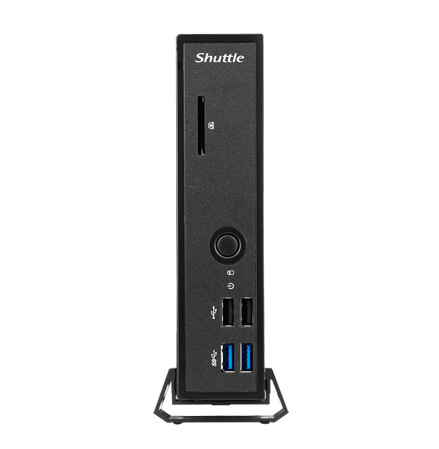 By entering BIOS to set up the Power on by RTC, Shuttle’s DS437T allows user to set a time to boot up the system, which can also be turned on and off with the Windows task scheduler. This feature will benefit electricity and energy saving as well as eliminating the cost of on-site service. With exclusive low-power consumption design and fanless cooling, the DS437T is equipped with Celeron 1037U dual-core processor and only 17 watts TDP. It runs on a mere 65W adapter in full use and keeps stable for long-time operation. Use with solid-state disks and create an operational platform completely free of noise. It’s ideal for noise sensitive environments like hospitals and libraries. With External power button and Clear CMOS pin-connector, users can power on the machine by a separate remote line. The external Clear CMOS function allows users to reset the BIOS settings without opening the chassis. The DS437T is designed for easy configuration. Simply remove only two screws to open the back cover and install memory module, hard disk (or SSD), and other hardware components. No cable is required and no cooling system needs to be installed—the system is quickly completed.